LoveFashionSales acts as a personalised comparison service designed to help you save money on clothing. As soon as your favourite items go down in price, it alerts you to price reductions from your favourite designer and high street fashion brands via email. Perfect. Sign up now though, as you can’t browse otherwise! Sign up with your Facebook account to make the process even quicker! 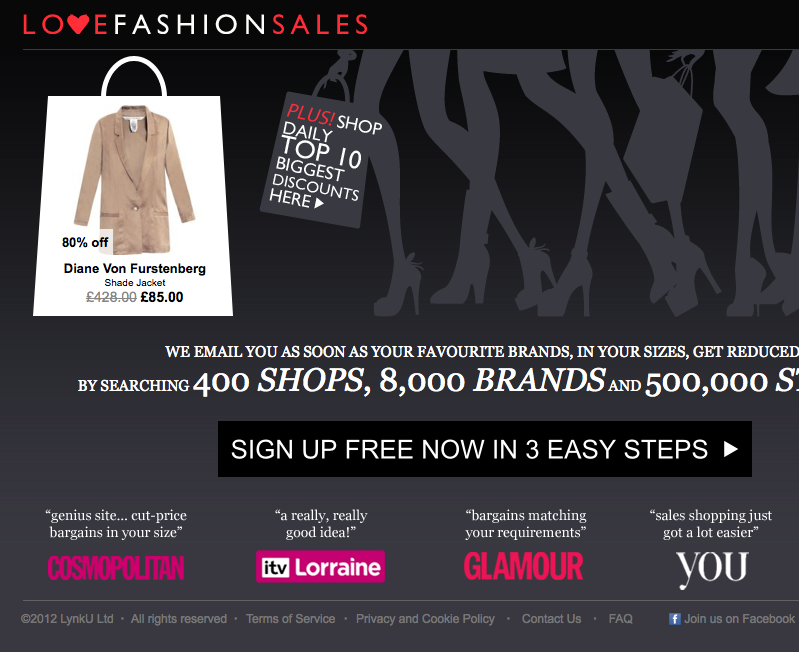 LoveFashionSales is ideal for those looking for a bargain – a very specific bargain. With the choice of size, brand, clothing type, price and even the frequency of your e-mails, the power really is in your hands. Sign up, add your preferences and wait for your favourite clothes to come to you. Go back to Clothes and Accessories category to find more websites and companies offering discount deals and offers on clothes and accessories.